Removal ProcedureRemove the air cleaner assembly. Refer toAir Cleaner Assembly Replacement.Remove the camshaft cover. Refer toCamshaft Cover Replacement.Remove the spark plugs. Refer toSpark Plug Replacement.Remove the right engine splash shield. Refer toEngine Splash Shield Replacement - Right Side. 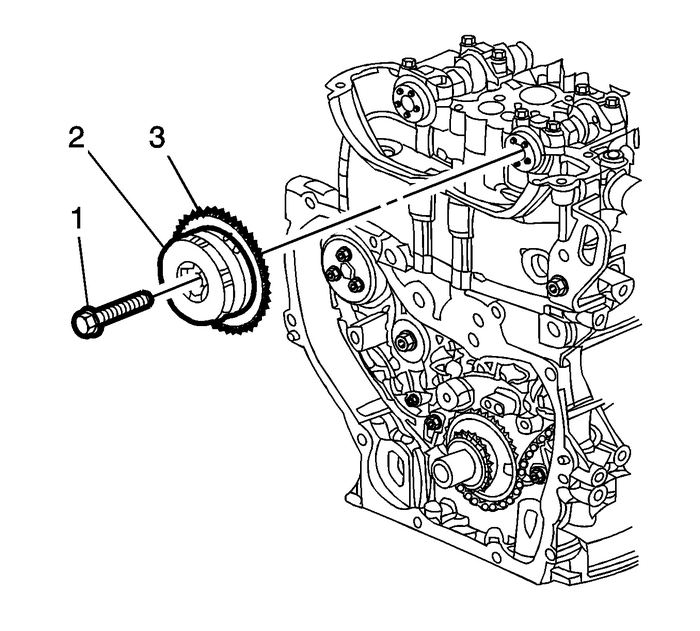 Rotate the crankshaft clockwise and install theEN-48953retention tool(1). 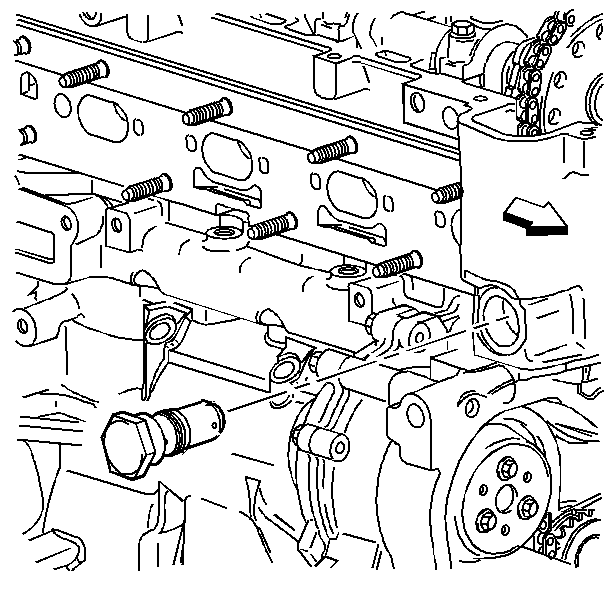 Install the camshaft actuator retainer bolts and tighten to10-Y(89-lb-in).Use a wrench on the camshaft flats to hold thecamshaft.Loosen, but DO NOT remove the intake camshaft actuatorbolt.Remove theEN-48953locking tool(1).Clean the timing chain and gears with solvent. 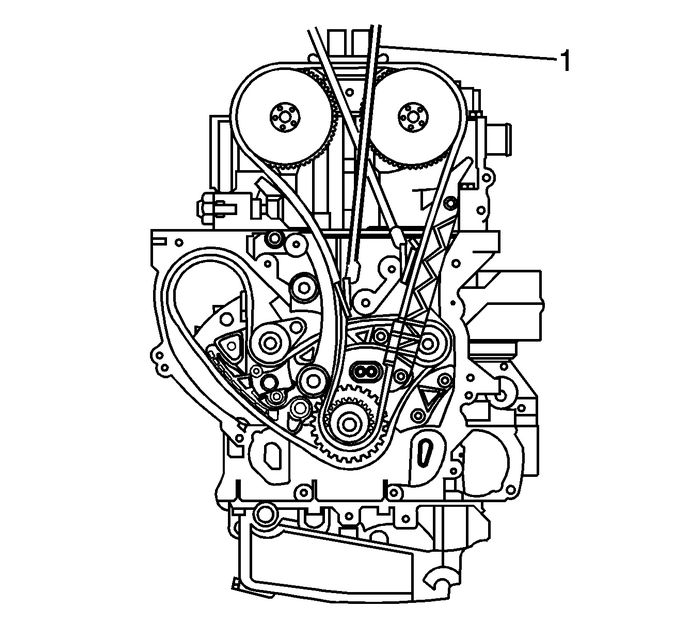 Note:Ensure the timing chain and the camshaft position actuatorsare marked for proper assembly. Mark the intake and exhaust camshaft actuators and therespective locations on the timing chain. The intake camshaft actuator should not rotate during theremoval or installation.Ensure the tips of the tool are fully engaged into the timingchain. The retention tool rod can be used on the back side of thechain to ensure the teeth from the retention tool areengaged.Install theEN-48749retention tool(1) to the intake side of the timing chain. Install theEN-48749retention tool(1) to the exhaust side of the timing chain. 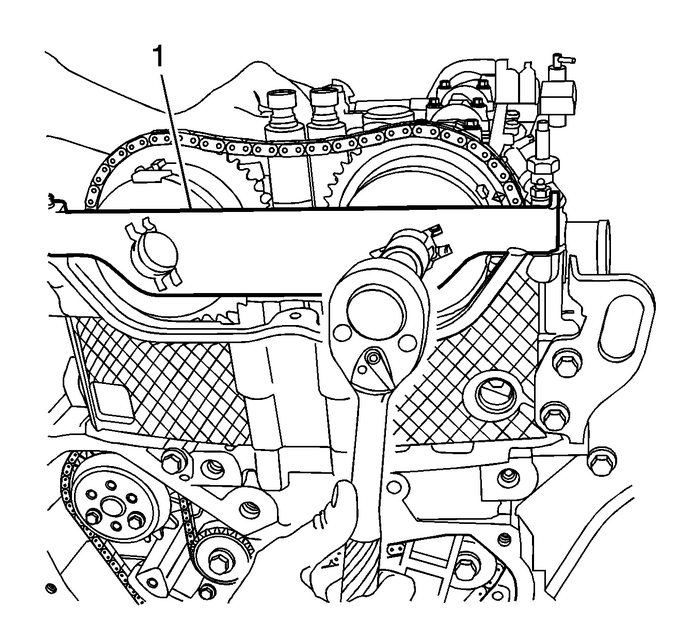 Ensure that the alignment mark made previously on the intakecamshaft actuator is still aligned properly with the mark on thetiming chain.If replacing the actuator, transfer mark made on old actuatorto the new actuator.Install the timing chain onto the intake camshaftactuator.Align the intake camshaft actuator alignment mark madepreviously with the timing chain mark and install the actuator ontothe camshaft rotating the exhaust camshaft clockwise, ifrequired.Install a NEW intake camshaft actuator bolt-(1)until snug. 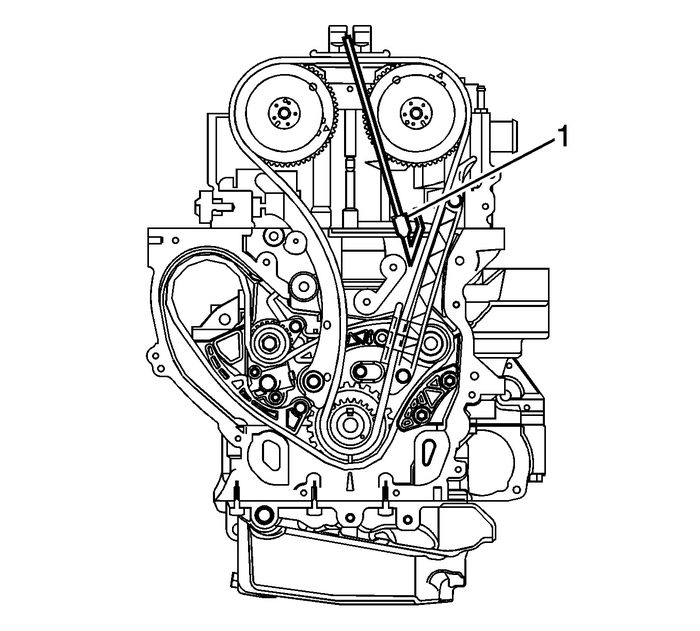 Remove the timing chain retention tool-(1) fromthe intake side of the timing chain. 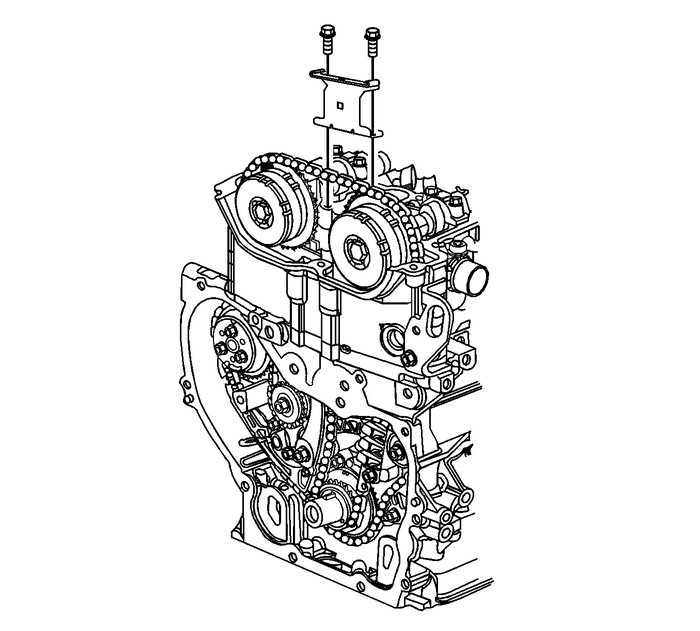 Note:Ensure that the alignment mark previously on the intakecamshaft actuator is still aligned properly with the timing chain.If the mark made previously on the intake camshaft actuator is notaligned properly, refer toCamshaft Timing Chain, Sprocket, and Tensioner Replacement. Remove the timing chain retention tool-(1) fromthe exhaust side of the timing chain. Note:Failure to reset the tensioner will allow the tensioner toover extend. limiting the timing chain life. Install theEN-48953retention tool(1) .Install the camshaft actuator retention tool bolts andtighten to10-Y(89-lb-in).Tighten the NEW camshaft actuator bolt to30-Y(22-lb-ft) plus an additional100-degrees using theEN-45059meter. Use a wrench on the camshaft flats to hold the camshaftwhile tightening the fastener.Remove theEN-48953retention tool(1). Install the upper timing chain guide and bolts and tighten to10-Y(89-lb-in).Install the spark plugs. Refer toSpark Plug Replacement.Install the camshaft cover. Refer toCamshaft Cover Replacement.Install the engine splash shield. Refer toEngine Splash Shield Replacement - Right Side.Install the air cleaner assembly. Refer toAir Cleaner Assembly Replacement.